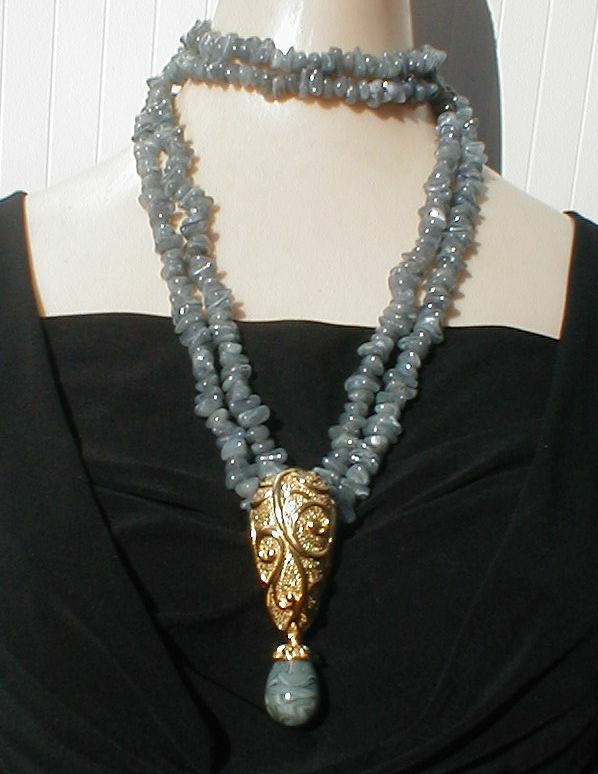 Barrera created this beaded necklace rope for Avon in soft gray-green marbleized light-weight plastic tumbled beads to look like jade, added a hefty scrolled motif goldplated pendant with a marbleized tear drop. 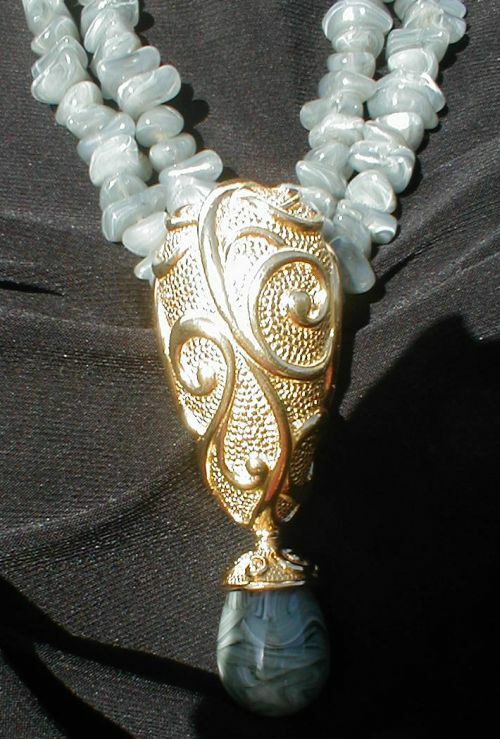 Pendant is removable and can be used separately as a brooch. Rope Size: One is approx. 39", the other approx. 38" long. No clasps. 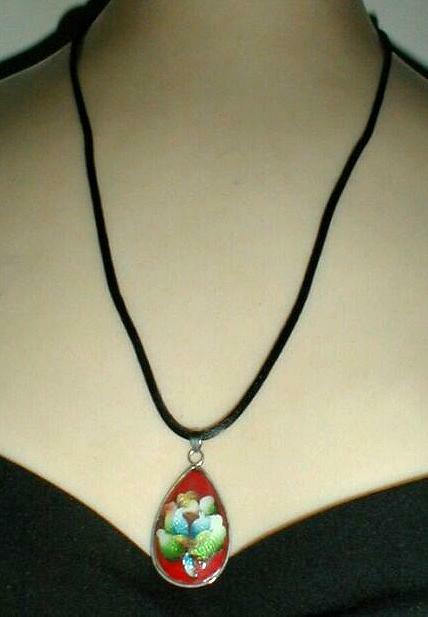 Pendant Size: 3" long approx. incl. drop. View closeup of pendant here, front. Closeup of reverse of pendant with Barrera mark. 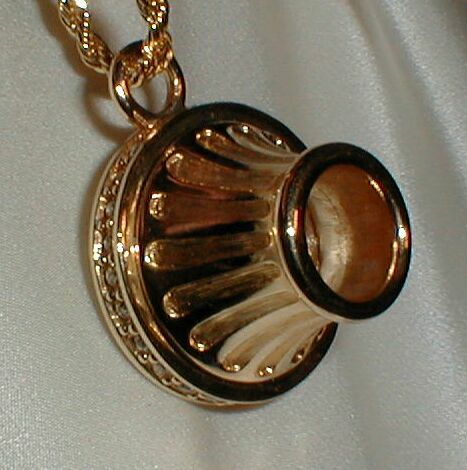 Closeup of reverse of pendant with pin stem closed. A different way of wearing the ropes. 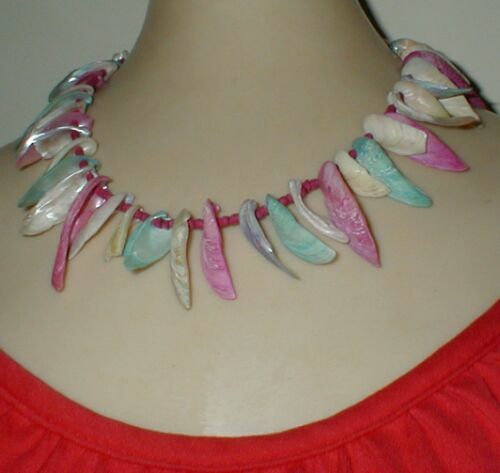 Sweet Hawaiian style all-shell necklace in soft pastel colors perks up any face, and blouse or tank too. Barrel clasp. Assorted motifs: Teardrop, Oval, Round, Heart, on black silky cord 24", spring ring. Sizes: 1 to 1 1/2" approx. $12.00 each, 2 for $20.00, assorted. 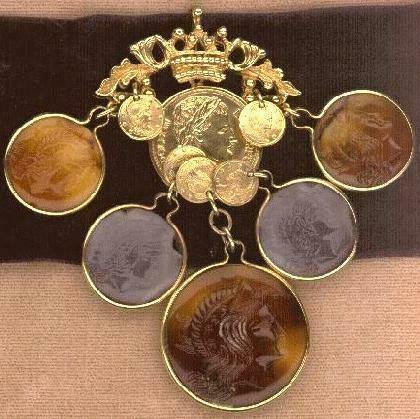 Five intaglio faces in hard plastic drop from imitation Roman coin center accented with tiny coins, and topped with a crown. Marked Florenza in cast. Probably made in the 1970s, condition like new. No chain. Velvet ribbon not included. For a different fashion look, click here to see the same pendant attached to a 4-row heavy gold tone chain necklace, available separately for $15.00, email about it if interested. 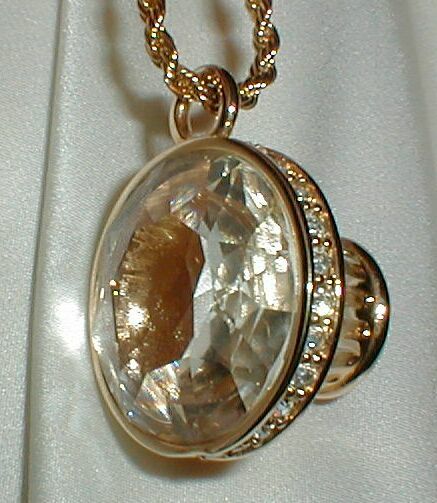 Size: 3 1/2" H x 2 1/4" W.
Unusual and cute prism pendant on long goldplated chain sports a 1" wide facet-cut genuine crystal surrounding by rhinestones and set as if in an oldfashioned one-eye binocular. When the small end is held to the eye the whole world turns prismatic. A conversation piece! Original Vonelle paper tag also states SWAROVSKI CRYSTAL. Circa 1980s. View closeup of pendant here, and back here. Size: Pendant: 1 1/8" dia. 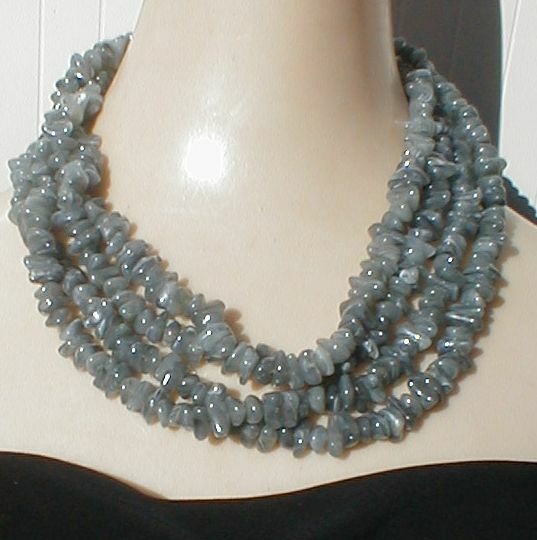 Chain neck length: 36".